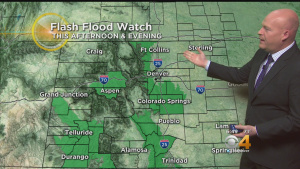 DENVER (CBS4) – We’ll see more clouds than sun today as monsoon moisture flowing in from the southwest combines with a cold front from the north. 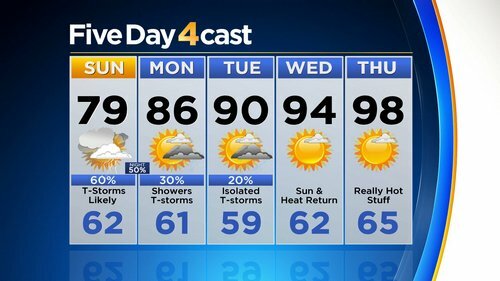 That means a much cooler afternoon for most of the state including metro Denver with highs only around 80 degrees and a good chance for widespread showers and thunderstorms. Mid to upper 90s are still expected on the southeast plains with lower 90s across western Colorado. Some of the storms today will have the potential to produce heavy rain in a short period of time and that means we are very concerned about flash flooding. 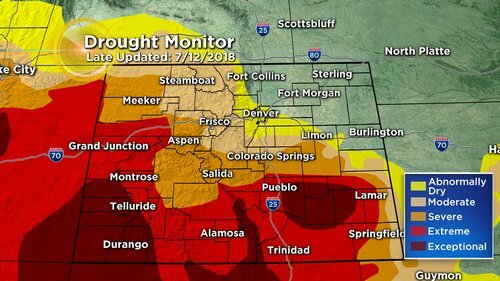 Several watches have been issued around the state including for the major burn scars, the Front Range foothills west of Denver and the Palmer Divide. A few storms will have the potential to produce hail too. Temperatures will stay below normal Monday and we’ll see another chance for afternoon showers and thunderstorms but then hot and dry weather will return to the state starting Tuesday into Wednesday.